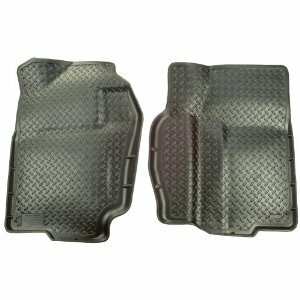 Replace your factory floor mats with superior Husky Liners custom molded floor liners and discover peace of mind. No matter what you drive to get from here to there, no matter what your job is you use your vehicle and it gets dirty. Gravity ensures that the messes that happen inside your vehicle end up on the floor. Drink spills, the gunk off your shoes and whatever the kids drop all sink into a factory floor mat and ultimately your carpet. As if you needed one more thing to worry about? When you have custom molded floor liners from Husky Liners, you can relax when the spills happen. Our floor liners are not your typical floor mats. Our Engineers use cutting-edge laser scanning and computer design to create the worlds best custom floor liners. Husky Liners fit the contours of your vehicles floor area specifically and provide more coverage and more protection than the factory floor mats ever could. Husky Liners look great and install in seconds. They feature a raised lip around the edge to keep messes contained and away from your carpet. Husky Liners protect your investment by withstanding the damage from water, mud, dirt, oil, gas and battery acid. Produced from our innovative and patented material, Husky Liners are guaranteed not to crack or break for the life of your vehicle. Cleanup is amazingly fast and easy: wipe your liners off with a damp rag for larger messes, simply hose them off. Exclusive to Husky floor liners are Sta-Put Nibs on the reverse side that grip the carpet and help keep them in place. Get Husky Liners for your vehicles carpeted floor areas: front row, second and third row, rear cargo and trunk. Offered in black, grey or tan to compliment every interior. Hundreds of applications are available for cars, trucks, SUVs, crossovers, and vans.